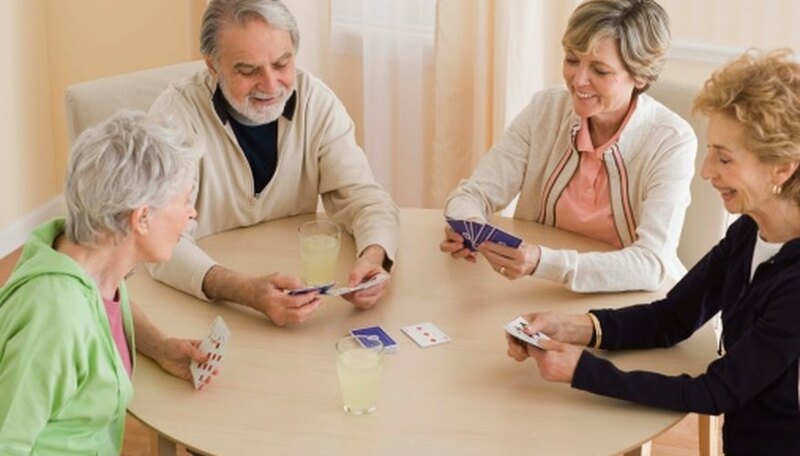 Hand and Foot is a canasta style card game with numerous variations, many of which are available on this site. One version uses Rook cards in place of standard face playing cards. The purpose of Hand and Foot is to form books of seven cards each. The books are either pure -- all the cards are the same -- or tainted -- wild cards were used to get to seven. Once seven cards in a book is reached, the book can be closed. Once two pure books and three taints are reached, the player can go out to end the round. Remove the Rook from each of the decks and then combine and shuffle the four decks of cards. Deal each player 13 cards for their hand and then 11 cards for their foot which is set aside without being viewed. Draw two cards from the remaining deck to begin play. The two cards are added to the hand. If a play can be made, then cards can be played down. Cards are put down in books of cards which must start with at least three cards. All of the cards must be the same number, or include wild cards. Ones and twos are the wild cards. Discard one card from your hand to end your turn. Turns continue in this manner for all players. Take and look at the cards in your foot once all of the cards in your hand have been used. Continue the same style of play with the foot until sufficient books are closed to go out and you can play the remained of your cards. Score the points. Going out gets 200 points, closed pure books get 500 points, closed tainted books get 300 points, then points are assigned for the individual cards. Ones are worth 50 points. Fourteens and twos are worth 20 points. Fours through nines are worth 5 points each and 10s through 13s are worth 10 points each. Any cards held by players that did not go out are subtracted from their score. Red and black threes penalize the player by 100 points while green and yellow threes only penalize by 5 points. Michael Rytting has been writing since 2011. His professional interests focus on materials, especially plastics. He also has experience in metal refining and processing. He received a Bachelors of Science in chemical engineering from Brigham Young University and has been issued a U.S. patent. What are the Rules for Canasta Triple Play Hand & Foot?